Situated in Hubei Province, Wudang Mountain is a famous mountain sacred to Taoism and birthplace of the art of Wudang Boxing. The scenery here is very beautiful. A lot of marks of long history and rich culture of the mountain can be found on the mountain, while the Taoist architectural complex, mostly built in the Ming Dynasty (1368-1644), was inscribed on the World Heritage List. The main tourist spot are Xuanyue Gate, Yuanhe Taoist Temple, Yuzhen Palace, Zixiao Palace and Golden Hall. Mount Wudang is perhaps the most famous Taoism holy land in China. I wonder what we can cook up this weekend?! but it should be a retreat of sorts. One that will allow me to reconnect with myself, and nature. 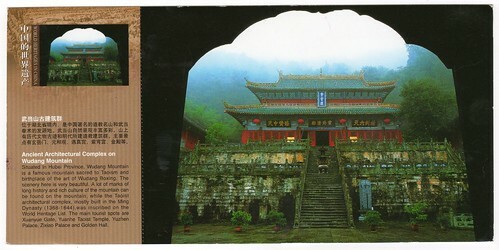 Thanks for sharing your post card with us it is beautiful and make my desire to travel to china stronger. I am hoping to get to China in March 2009. I think the history and culture is fascinating I will be checking the tour itinerary to see if it travels through Wudang Mountain. I hope your own little weekend retreat allows you the reconnect you desire. Are you going to have dinner at the Foo Yong Buffet? A co-worker of mine just got back from France and was sharing his experiences with me this morning. My heart yearned for Europe with each story. I still keep a 5 Euro in my wallet from last year's trip to Ireland. Darrin must think I'm nuts. YOU ARE NOT TAKING CODY TO BERGER KING AGAIN THIS WEEKEND.where ever you go have a restfull time. TD: Hmmm sounds good.....No Chinese buffets for me this weekend.....I'm thinking camp food! Pod: Na, no fast food here......thanks. I am going to Hong Kong in August. If you send me your address I will send you a postcard! Thanks for sharing your photo! Postcards are GREAT - I'll join you on the getaway! Have a great weekend!